So much hoopla over The Passion of the Christ, we forgot to say anything about the video release of The Gospel of John, a word-for-word adaptation that had its premiere at the Toronto Film Festival in September and very slowly made its way west, finally coming to Vancouver theatres just one week before Easter. Of all the gospels to commit to film, John’s may be the most unlikely — it has only a few dramatic high points, such as the miracles, and it is full of long speeches. But film versions of Matthew and Luke already exist, and there is so much unique material in John that it deserves a film of its own. On one level, it is kind of absurd to treat a book as though it were a movie script. And yet, if you are like me, you remember things better after they have been filmed or performed in some way; films like this can serve as helpful memory aids. You just have to make sure that the filmmakers’ images don’t overpower your memory of the words. For example, John’s gospel never states that Jesus was baptized — but the film shows this event anyway. Of course, the baptism of Christ is described in the other gospels, but adding material from outside John’s gospel may change the tone and even the purpose of the actual text. Viewers may also want to discuss whether it is significant — and if so, in what way — that the film puts Mary Magdalene at the Last Supper and Gethsemane. The film suffers a bit from a common tendency in this genre to make nearly everyone sound like a well-educated Briton (though the traitor Judas is played by a Canadian). But Henry Ian Cusick delivers one of the more charismatic, confrontational and compassionate interpretations of Christ around; and Christopher Plummer’s subtle, supple narration is a treat for the ears. Interestingly, the producers of both recent Jesus films have visited this genre before. 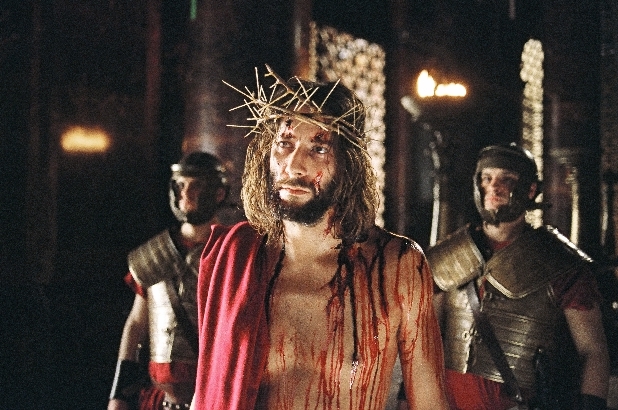 Mel Gibson’s Icon Productions had a hand in the animated British-Russian film The Miracle Maker; and Garth Drabinsky, a Jewish producer who worked closely with Christian scholars on The Gospel of John, was head of Cineplex Odeon Films when that company put up half the budget for Martin Scorsese’s The Last Temptation of Christ.